Put a video globe wherever there was once a dreary, printed globe – including every school worldwide. Global Imagination was founded in 2002. We began by selling large globes to major museums and government institutions for informal education. 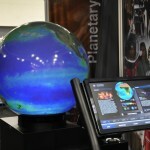 Now, each year more than 40 million people in 39 countries see a Magic Planet in action at the Smithsonian, NASA, NOAA, The American Museum of Natural History, The European Space Agency, Copernicus Science Center, and at hundreds of other institutions around the world. These relationships have enabled us to aggregate the world’s largest collection of global content, including museum exhibits; IMAX®-like spherical movies; global images, animations, real-time feeds, visualizations, etc. Customers use what we’ve collected “off-the-shelf”, and incorporate content from our collection into their own lessons, projects, and presentations. Most of our customers contribute content they develop back into the collection so it can be shared freely with other Magic Planet users. As our prices dropped, through some serendipity we formed a relationship with the Chinese Ministry of Education (MoE). Subsequently, they ran a large study on the efficacy of the Magic Planet in K-12 classrooms – they studied 1,400 students learning 15 subjects with the Magic Planet for a full year. The results were impressive: 16% average improvement in comprehension; major improvement in class participation and collaboration; significant increase in desire to learn geography and so on. Based upon the results of the study, the MoE signed an exclusive agreement with Global Imagination, and made the Magic Planet part of the recommended equipment standard for Chinese schools. They expect, over time, that there will be at least one Magic Planet for every school in the country. Although no comparably large studies have been performed outside China, anecdotal results from K-12 schools elsewhere reflect similar – if not greater – efficacy. Now, with the Chinese market for Magic Planets established and growing rapidly, we’re focused upon bringing the benefits of the product to schools worldwide. We’ll leverage our huge library of existing content from premier informal education institutions as well as the tremendous improvements in learning that the Magic Planet provides to revolutionize the way global information is taught and learned.